Nature Kids offers a friendly setting for preschoolers to develop social, communication, and motor skills. 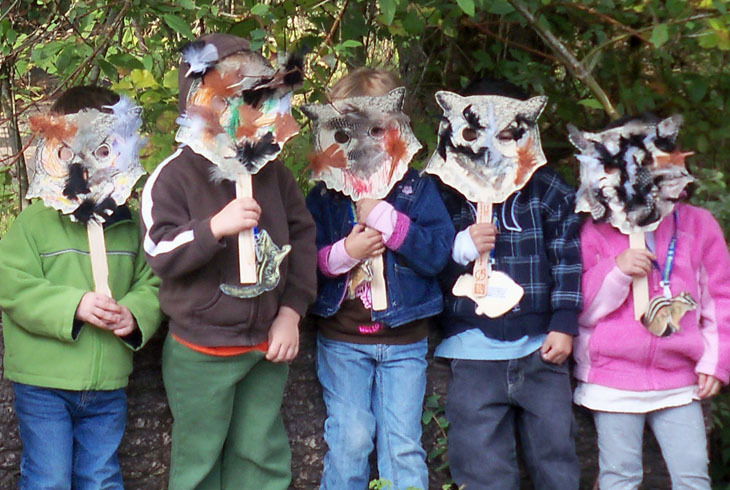 This nature-based program for preschoolers offered through the Tualatin Hills Nature Center introduces developmentally appropriate activities throughout the year in a curriculum structure that focuses on experiential learning through exposure to nature and the changing seasons. Children develop skills through a balance of tactile activities, play, and academic experiences. They are given the opportunities and guidance to advance communication and problem solving skills. Numbers, letters and words are introduced through structured nature-based activities and observation of the seasons and rhythms of nature. Children will form friendships, learn respect, and have the opportunity to grow with the help of caring teachers and supportive parents in a safe, yet active, natural environment. Registration for the 2019-20 school year for all Nature Kids Programs is open. Please contact the Nature Center at 503-629-6350 with registration questions. To secure enrollment, a non-refundable, one month deposit is required. This deposit secures enrollment and 100% of the payment is applied to the May 2020 tuition. No deposit is required to be placed on the waitlist. If you would like to set up a time to visit or have any questions, please call the Nature Center, 503-629-6350. The Dragonflies program at the Jenkins Estate (located at 8005 SW Grabhorn, Beaverton, OR 97007) takes place three days a week in the morning and provides a strong foundation for children that will enter kindergarten the following year. The Hummingbirds program at the Jenkins Estate (located at 8005 SW Grabhorn, Beaverton, OR 97007) takes place twice a week, providing a positive and nurturing first school experience. Children will enhance their social-emotional developmental skills by learning to follow routines, listen to directions, share and make new friends. While this is mainly a year of socialization and learning through play experiences, children will be introduced to shapes, colors and science through songs, stories, activities and exploratory hikes. Children must be able to use the restroom independently. The Ladybugs program takes place three days a week in the morning and provides a strong foundation for children that will enter kindergarten the following year. The Owls program is three days a week in the afternoon and provides a strong foundation for children that will enter kindergarten the following year. The Chipmunks program is twice a week and provides a positive and nurturing first school experience. Children will enhance their social-emotional developmental skills by learning to follow routines, listen to directions, share and make new friends. While this is mainly a year of socialization and learning through play experiences, children will be introduced to shapes, colors and science through songs, stories, activities and exploratory hikes. Children must be able to use the restroom independently. Enjoy a nature adventure and foster your preschooler's natural curiosity. Come together with friends for hands-on activities, songs, stories, crafts and outdoor play. This series is a good opportunity for preschoolers to try and explore nature programs in a safe setting. Days: Individual sessions available on Tuesdays and some Thursdays, September through May. Take all of the classes or whichever one fits your schedule.